This project came out of several months of making daily self-portraits. These were quick drawings done each morning as a way of practicing seeing. As the drawings accumulated, I wanted to see them at a larger scale and in relation to one another. This is the installation that resulted. Drawing as object and action. Provisional. Constructed. Sculptural. Participatory. Performative. A line hangs on the wall, draped across a series of small hooks, its weight creating catenary arcs toward the floor. It is dimensional. There is an urge to touch the sensuous, uneven, handmade line which is comprised of three successively larger loops. The mind firstly wants to know ‘What is it made of?’ and then quickly the body wants to touch and play with it. The artist has anticipated these responses by sharing the medium list of lead, rubber, and offers an invitation to engage with the work by following a set of simple instructions which are also outlined in shorthand in the title of the work, Hanging Drawing II (20 successive drawings unique and unrehearsed). Hanging Drawings create a situation where drawings arrive momentarily through the slightest effort made by people other than the artist. The artist has invented the drawing tool and laid out the instructions for its use but it is the performer who ultimately makes the drawings. This work questions the relationships between artist and beholder/performer as well as the site of the gallery as a place solely for completed works. 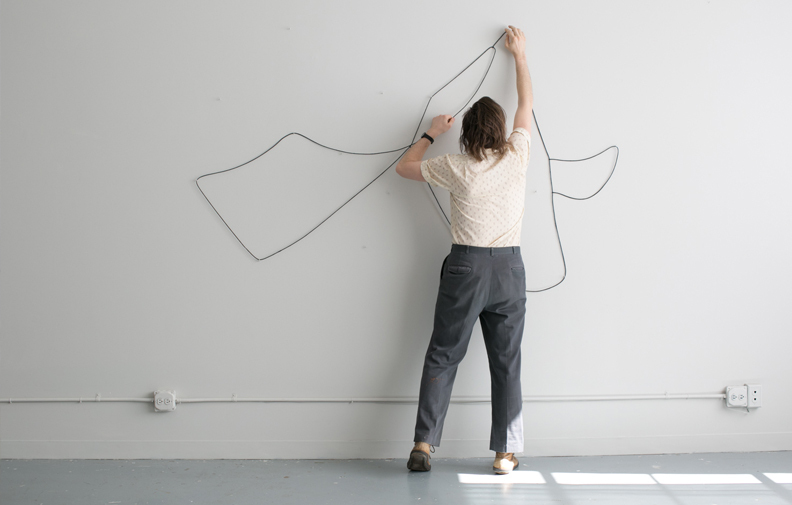 With Hanging Drawings, the beholder becomes the creator and the gallery becomes the studio. Although the actual system — line, hooks and instructions — can be acquired, the drawings created using the system are ever-changing and ephemeral. Link to: more than momentary: ENJOY artists book which documents the project. A series of 99 works on paper, gouaches and flashe on Berlin guidebook pages, 7.5" x 5.75"
"Murphy Spicer disassembled her printed city guide and used the pages themselves to create these works. The outline of her biking paths became the most prominent shapes. Smaller shapes began as images in the guidebook — architectural details, close-ups of streets, monuments. She cut out these small elements, painted them and, in some cases, reinserted them into the page, often intersecting or floating closely in relation to the larger shape. Clues to the origin of these smaller shapes are painted over, the literal reference masked by layer upon layer of paint. Only the shape remains. And yet, all elements of this dislodged and collaged Berlin are connected to the city. Color has been a way into this work, according to Murphy Spicer. Color serves as a means of animating shape, for perceiving and observing shapes in interaction. This multilayered dialogue of color and shape is created in the spirit of the peripatetic cyclist, deliberately serendipitous, entering new territory with open eyes and anticipation. Berlin is a fitting subject for this work. There is an enormous diversity of shapes that comprise the city, the intended or unintended result of art, design, architecture and changing borders. Murphy Spicer’s work reveals her keen awareness of this. The physiognomy and layout of Berlin has changed in its recent past like no other major European city. The destruction during World War II, the separation into sectors by the Allies, the building of the Berlin Wall, the fall of the Wall and the reunification of the city — all of these events cut, dismembered, and rejoined the city over and over again, changing its texture dramatically. The continuous process of overwriting, deleting and rewriting is ongoing. This city has constantly re-formed itself, storing its past in the evolving layers of space that is Berlin today. With the Biking in Berlin series, Murphy Spicer has added her own layers, her traces of personally experienced space, to the stratification of Berlin. This reference to the lived experience within the larger timescales of history makes the series so intriguing, the evanescent shapes inviting reflection on the shapes of one’s own personal trajectories in this place. The eclectic, vibrant cosmopolitan capital that we take as unbounded Berlin today is still imprinted in collective memory and the spatial memory of the city with what used to be East and West. Today we move about the city with ease. In the midst of daily routines, rarely do we recall that such fluidity was impossible for most of the second half of the twentieth century. The immediate sense of freedom within the space of the city that cycling brings expands and deepens as we become more conscious of the historical forces that have shaped this place. Perceptively, this makes Berlin even more ample. These small works reflect the multi-faceted metropolis: various shapes, layers and surfaces, its imperfections, its rough edges, its constantly dislodged and collaged spaces. Within the economical containers of these small works lies the universe of this place steeped in histories, the intimate trajectories that define our everyday lives and the larger contours of history that comprise Berlin." 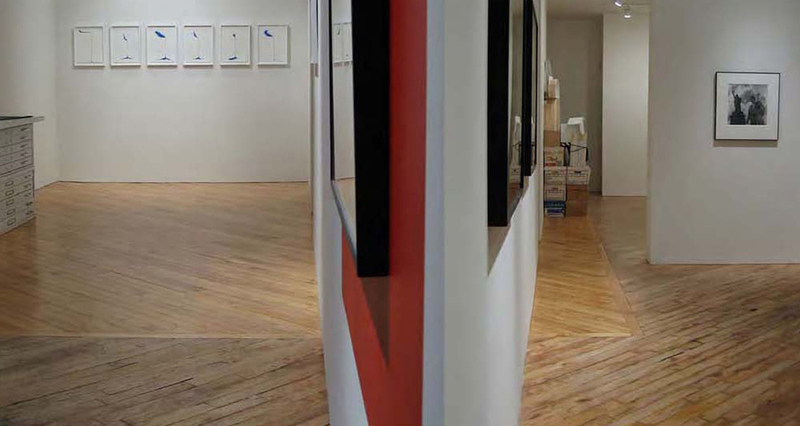 Drawing from Above and Below uses simple materials placed in a specific manner in the space to create a drawing which highlights existing characteristics of the gallery. A standard 4 x 8' piece of glass is placed abutting a 4 x 8' piece of mirror. The glass frames a portion of the geometric design on the floor and the mirror reflects the ornate designs on the ceiling. This work flattens aspects of the architectural space bringing them into relationship with each other. This work was made in an unusual manner in that I never physically experienced the space myself and, working only with photographs and drawings from the curator, directed the making of the work from a distance. Artist colleagues acted as my proxy, a local glass man provided use of the materials temporarily and a photographer documented the work. I never experienced the work directly myself. This piece is part of my ongoing questions around what comprises the work of art and who creates it. The Floor in the Floor is another instance of creating a kind of drawing in the space using existing qualities of that space. This work was sited in the Bernard Toale Gallery which, at the time, was comprised of three distinct gallery spaces. The three galleries were used in different ways and connoted varying levels of significance of the artists shown in each gallery. 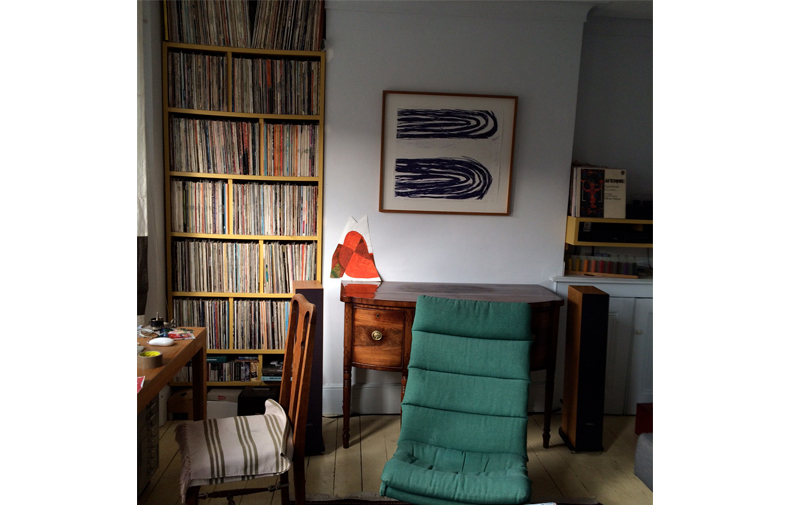 Previous configurations of the space remained, revealed by the distinctly different patterns of floorboards. In this work, I further highlighted the earlier configuration by having only that area refinished to a smoother, matte gloss finish. In this work, I disregard the hierarchy of spaces within the gallery and allow my work to invade all three spaces. The work is both subtle (some people didn't even notice it) and emphatic as it is the one artwork in the gallery that is actually touching the beholder's body. This work came out of a series entitled After Hours, wherein the gallery owner gave me access to the gallery when it was closed. Over two years, I developed a number of performance and installation works, some of which appeared in exhibitions and others which went on to become further developed works. Floormap is just that, a map of the floor of the gallery I was offered in which to exhibit my work. In order to become familiar with the space, I devised various strategies to physically "learn" the space. One of those approaches was to draw the space by making its shape in landscape cloth. I then moved the floor to the walls, folded it up and took it out into the neighborhood, virtually bringing the gallery to the city. This work literally lays the gallery on top of the world allowing an opportunity to look at the two places in relation to one another. The final form of the work was a set of six 5" x 7" postcards which were placed in the local pharmacy for sale. 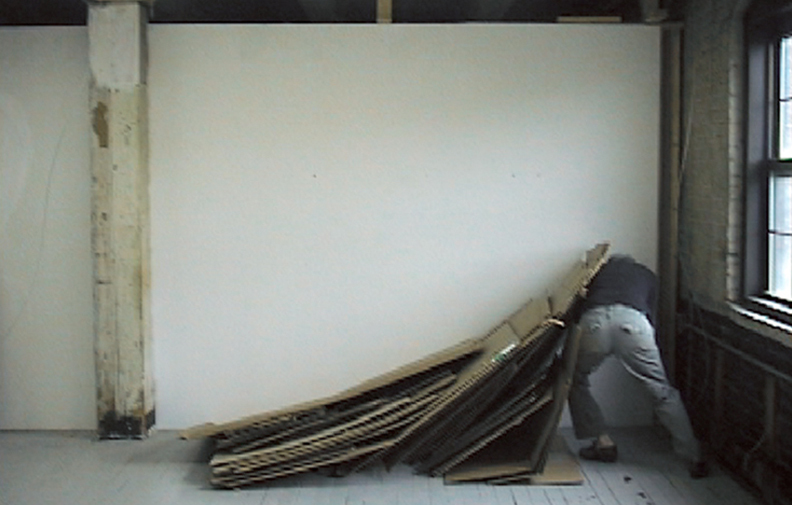 Seep, 2004, birch plywood, latex paint, vinyl, in Seamless exhibition at Memphis College of Art, including Amy Sillman, James Siena, and Dan Devening. 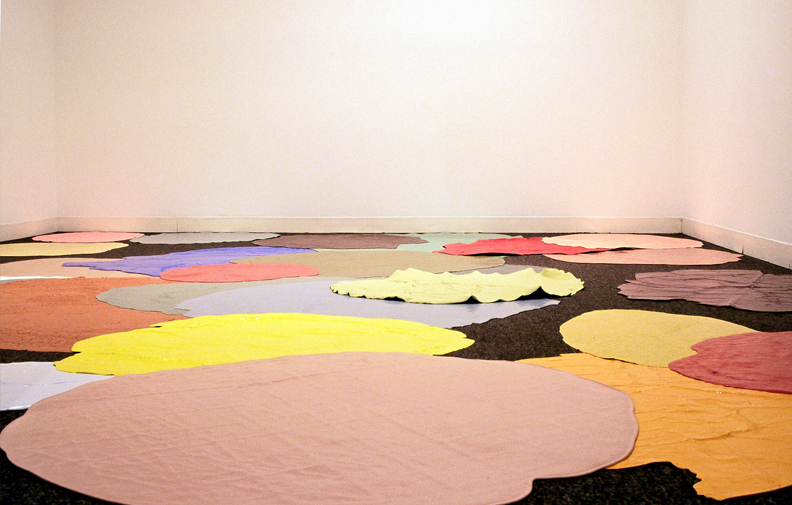 Seep is part of the series of poured paint works I created onsite between 2001-2004. This work takes the minimalist forms of the birch plywood and animates them with trails of red paint. The paint is thickly poured latex which sits as a dimensional object on the floor. Poured Paint represents a shift in my work toward task-like approaches to making. This work was inspired by a house painter's description of how he is required to detoxify leftover paint by pouring it out onto large sheets of cardboard to dry and then be disposed. I appropriated his task and instead poured the paint on plastic sheets, lifted up the resulting paint puddles and placed them in the gallery. The resulting work was described as "unapologetic" and "transparent" by beholders which are two qualities I seek in my work.